Welcome to the Epilepsy Research Centre website. Here you will find information about our many research projects and the medical services we offer to patients. Epilepsy is a neurological disorder that affects 3% of the population at some time in life. It requires a multi-disciplinary approach to clinical care and research, involving clinical and basic scientists with a variety of skills. Current research challenges include understanding its molecular basis, probing abnormal brain networks, interpreting complex imaging findings and encompasses complexities of clinical phenotypes, effects on cognition and behaviour and social implications. 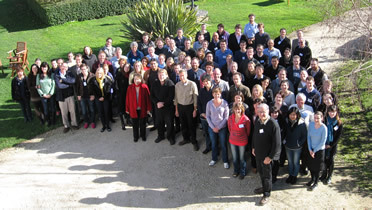 The photo above shows Epilepsy Research Centre staff and collaborators at the annual Epilepsy Research Retreat. Each year we meet to form closer ties across disciplines, discuss the progress of our research and plan studies for the future. 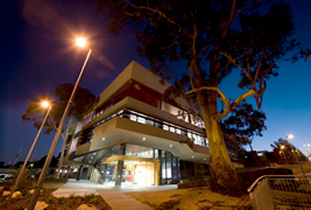 The building pictured is our new location at the Melbourne Brain Centre, 245 Burgundy Street, Austin Health, Heidelberg. Comprehensive Epilepsy Program (Clinical Services Program): Patient information about the assessment and treatment of epilepsy through the Austin Health services Comprehensive Epilepsy Program, including the Austin Epilepsy Clinic, First Seizure Clinic and Inpatient Monitoring. Information for patients and referring doctors is included.